Game of Thrones, HBO’s highly anticipated fantasy drama, has returned for its fourth season. Viewers tuned in Sunday night to the usual blood, lust, and individual quests that keeps everyone coming back for more. As a warning to anyone who has not seen Sunday’s premiere, there are many spoilers in this article so read at your own risk. The premiere picks up from the last seasons “red wedding” which featured the murders of Robb Stark, his soon-to-be-bride, and mother, Catelyn. To add insult to injury, Robb’s former sword, Ice, is melted down and made into two swords, hence the title of the first episode. One of the swords is given to Jaime, who has since returned and also without his right hand, only to find that his troubles at home are only beginning. After refusing to abandon his post in the Kingsguard, he is disowned by his father, Tywin. If things weren’t bad enough, his lover and sister, Cersei, is no longer feeling the love between them. Following the unfortunate events for Jaime, in preparation for King Joffrey’s wedding, Tyrion finds himself greeting a new character, Prince Oberyn Martell. Bad blood is quickly introduced between them when Martell explains how his sister was raped and murdered by one of the Lannisters. An impression is left that Prince Oberyn is there for reasons other than attending Joffrey’s wedding. 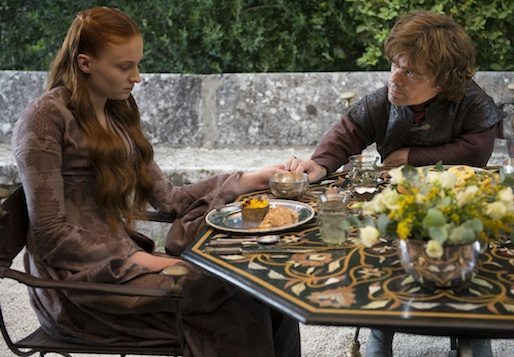 If things weren’t hard enough for Tyrion, he must now help Sansa cope with her depression after hearing news that her mother and brother were killed. Continuing her quest to amass a larger army and free more slaves, Daenerys and her dragons tread onto Meereen only to find a dead slave every mile towards king of slave cities. This only fuels her anger and now we must wait in anticipation of her arrival to the city in which viewers can expect a bloody brawl. Meanwhile, Arya, Sansa’s younger sister, and Sandor “the hound” stumble upon an alehouse, which presents the opportunity to take part in some revenge. Overall, the season premiere of Game of Thrones quenched the thirst of many loyal viewers who waited in anticipation of several cliff-hangers from season three. One thing is certain; we can expect more blood-shed in next week’s episode.